This time I was in USA for about two weeks. I have been to New York, Boston and Chicago. Although we were celebrating our 6th wedding anniversary with my wife, music - especially jazz - was a real inflammatory as always. Although I have visited many touristic attractions, experienced many things other than music and seen many fantastic sightseeing places all around these cities - especially in Cape Cod - I kept this post related only with jazz clubs and record stores I have visited in these cities (besides some blues clubs in Chicago, a college from Boston and some classical concert places in New York and Chicago). If somebody wanted a single word from me about New York City, I would say "crazy". The time seems to be running fast in Manhattan. As a visitor - even you have a good plan and time of around a week - what you can get is generally digital samples of a continuous river of energy. You can find, drink, eat, taste or experience everything. Music - especially jazz - is an important part of this city. Any jazz lover in the world wants to be in New York. Most of the precious live records of jazz history are achieved in jazz clubs of New York. Many young jazz musicians were born, grown and became stars in these places. However, in my opinion, like many of other New York iconic properties, jazz became a partial-touristic attraction of the city in last years. As far as I have seen from my friends, even people who has no interest in jazz goes to a jazz club in New York. When you ask them about the performance, many do not know the name of the musicians and even the name of the place. Frankly, there are some touristic jazz clubs in New York, but whatever the current case is, being a home for many historical legendary jazz clubs, New York is always the most jazzy city of this world for me. 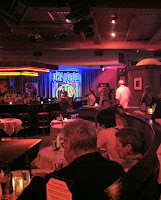 As you will read in following parts, having just a week I could only visit jazz clubs in central Manhattan. I hope I can visit jazz clubs in Harlem, New Jersey and Brooklyn for the next time. The club is located in Jazz at Lincoln Center near south-west corner of Central Park. You can reach there easily by subway - get off the train at the 59th Street Station and look for a building labeled as "Jazz at Lincoln Center" at the intersection of Broadway and 60th street. Broadway is passing through the circular road you are on. The club is at 5th floor of this building having a large stage whose background is the wonderful Central Park view with some nice architecture. For this reason, I strongly recommend you join the first set of any performance starting at 7.30 pm. This way you can see both the day and the night view. Besides, since the audience for the second set are generally waiting at the entrance for the first set to finish, joining the first set is also advantageous to spend some quality time before the performance by drinking nice cocktails or eating good food with this great view. As far as I have seen the line-up is changing each week and the bands are playing twice a night. There is the first come-first seat policy. For each set I think you should be at the club approximately 1 hour before the scheduled performance time. Considering the popularity of the musicians you can make this arrival before half or one and a half an hour. If you are new to Manhattan and using subways, I think you should add an additional half an hour as a safety margin to all your travels in case you can mixed up in the subway search or there is a problem in the subway station or line. If you are nearer than 1 mile to a place and there is no possibility for rain I recommend you to walk in this well designed matrice-like city. The doors are opening at 6.00 pm. 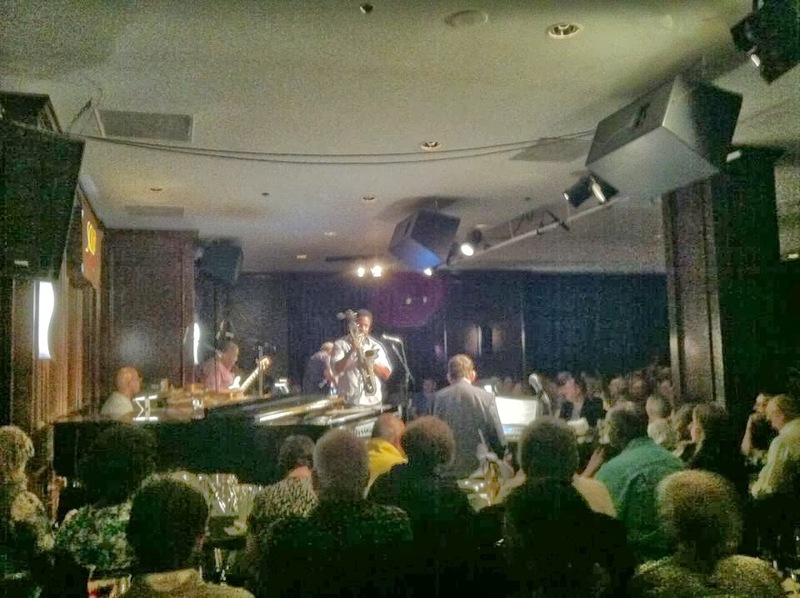 Dizzy's Club is one of the most classy jazz performance halls in this city, thus although there is certainly no dress-code policy I recommend you not to be too sport in clothes, casual smart will be more suitable. I was really wondering the performance of Ali Jackson Quintet especially because of the young pianist Emmet Cohen and experienced saxophonist Sherman Irby. Including the bassist Russell Hall and trombonist Vincent Gardner, the performance was fairly good and naive in sound which is consistent with the magic ambiance of the place. The full-bodied sound of Irby, soft touches of Cohen to the keys and swinging rhythms of Jackson were very well in harmony together. Smalls Jazz Club, which is located near Greenwich Village, is a really small, warm and sincere basement with its small stage covered by a very nice Louis Armstrong picture. The seats are almost randomly located next to the wooden bar which is extended as long as the club. Interestingly, as far as I have experienced, the acoustic is near perfect - in other words, the place is more than meets the eye. There are many sets in one night and according to their schedule at those days each band has a single - and fairly long - set. I have joined Gerry Gibbs Quartet's performance on August 5th: Gerry Gibbs (drums), Steve Wilson (saxophone), Mark Feldman (violin), Benito Gonzales (piano), Essiet Essiet (bass). I felt very lucky to be able to listen to Mark Feldman whom I follow over ECM. Besides, it was a privilege for me to listen to Steve Wilson, one of the best saxophonist of US recent jazz stage. The performance was very satisfactory from an overall point of view. There were many jazz musicians within the audience, the average age of the listeners is low and the sincerity of the place and stuff is like they are all reflected to the audience. Smoke is a bit far away from the other best-seller jazz clubs. It is almost at the north-west corner of Central Park between 105th and 106th streets. You can again use subway. The place is classy and warm at the same time. The stage is not too large and there is a fairly big bar that has a good view and acoustic condition. The tables are tidy but the only problem is that the sitting positions are looking to the stage with a 90 degrees angle and there are too many waiters walking around and serving food. I was at the forefront table and the acoustic was perfect. There are generally three performances each night: 7/9 pm sets with dinner and 10:30 set. Reservations are possible only for two first sets with dinner. For each set, first come-first seat policy is applied. It seems that the club has generally a different line-up for each day. I have been at this good jazz club to see Mike LeDonne's Groover Quartet. Although I was waiting to see Eric Alexander for the saxophone, Vincent Herring was there. I was glad to listen to him once more after his great performance in Ankara with our Turkish drummer Ferit Odman. It was absolutely a fantastic performance. I really understood why Mike LeDonne is shown as one of the best keyboardists in USA. Joe Farnsworth was also very successful on the drums. I felt myself very lucky when I saw that The Next Collective would be performing in Jazz Standard for the whole week with two sets for each night when I was in New York: Logan Richardson, Walter Smith III, Matthew Stevens, Gerald Clayton, Kris Bowers, Ben Williams, Jamire Williams. I had listened to them with Christian Scott for a very short time in last North Sea Jazz Festival. I was at one of the most famous jazz clubs of New York, Jazz Standard, for the first set at around 6.30 pm. I advise you to make reservations prior to going there but since the policy for the table plan is first come first seat again, to guarantee a good place to listen, you had better go to the club one hour before the performance. The place is wonderfully organised by its staff. The sitting plan at the forefront tables are not good since they are vertically located with respect to the stage and speakers. If you can go earlier you can take one of four or five horizontal tables that are behind these forefront tables to have a better acoustic and view. Jazz Standard is famous for its wonderful acoustic condition. This is also what I have experienced during the performance. The first piece of Next Collective's album Cover Art is Twice. They are generally playing this as the first piece of their live performances. With its interesting, energetic and extraordinary introduction part, Twice let the band members express their fresh styles and catch the audience with the first note. Different than the album and the live performance in Darling at Rotterdam, Ahoy, here in Jazz Standard the performance has started with a very low sound level. The audience was almost thinking of this as the part of the sound-check. But after first a couple of seconds I recognized it. As it was getting higher and higher in sound level we started to experience a wonderful performance. After having listened to him with Mark Feldman and Gerry Gibbs at Smalls four days ago, I could get a second chance to listen to Steve Wilson, this time with his quartet - Orrin Evans, Ugonna Okegwo and Bill Stewart. Frankly, Village Vanguard is the place that I was dreaming to see in New York because of its historic reputation. On entering the club that is located at a basement on 7th Avenue near Greenwich Village, I could see the history on walls and smell the jazz from the stage. It was fantastic to dream about - for instance - Bill Evans, Scott LaFaro and Paul Motian was performing at the same place and walking around for about 50 years ago before creating one of the most beautiful live records of all jazz history - which was just about 10 days before LaFaro died in an accident. The sessions were scheduled just like many clubs in NYC in Village Vanguard: two sets each night with the same line-up and a good band generally plays during the whole week. You can buy ticket from the internet for Village Vanguard. The stage and the seating plan is just as it should be. A large stage compared to the size of the place is very well observed and listened from a circular seating plan. The fact that there is no food service at the place is also a very useful property that is increasing your focus as a member of the audience. Steve Wilson Quartet's performance was certainly one of the best performances I have seen during my holiday in USA with its classic jazz style full of fantastic improvisational parts, energetic solos and high-quality collaborations. Another legend place of the jazzy city New York is located near Times Square. This place is named with nickname of one of the most important iconic personalities of jazz history, Charlie Parker - The Bird. Birdland is started to be called Jazz Corner of The World recently and it is certainly the most classy, large, popular and touristic place with Dizzy's at Lincoln Center among jazz clubs in New York. Surely, its touristic location has a very well contribution on its popularity. On entering the place you can see a large and beautiful bar next to the stage but I do recommend you not to make a reservation from this bar since it is a bit far and almost at the 150th degree of the stage line. If you'd like to experience a real Birdland performance you should pay more to sit on the tables having an incredible view of the stage and having a wonderful acoustic condition. The schedule is as usual again - two/three sets for each night of a whole week of same line-up. You had better to be a bit classy in clothes but there is again no dress-code. It was a real privilege for me to see Vijay Iyer as a guest musician to the Trio 3 - Oliver Lake (multi-reeds), Reggie Workman (bass), Andrew Cyrille (drums). Vijay was a musician that I was closely following from the label ACT with his wonderful albums. Especially the entrance made by Oliver Lake to the concert was exciting and interesting. After having listened to his albums for a long time, listening to Vijay Iyer was also a real joy for me. 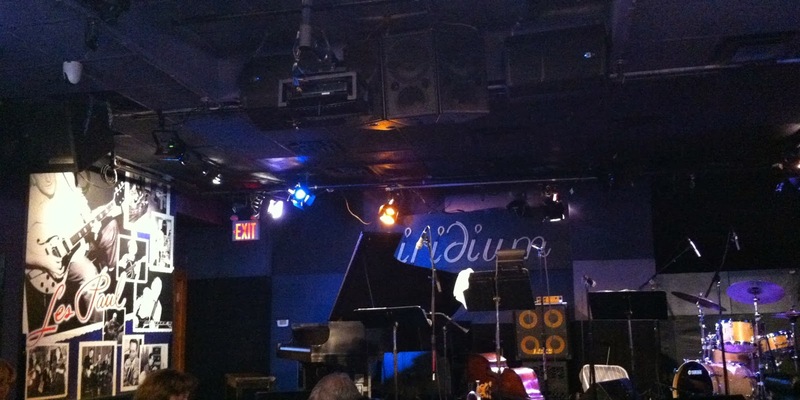 Being home for the legendary Les Paul, Iridium was another jazz club near to the famous Times Square. The band was Amina Figorava Sextet. Amina Figarova - piano, Bart Platteau - flutes, Wayne Escoffery - tenor sax, Alex Pope Norris - trumpet, Jeroen Vierdag - bass, Jason Brown - drums. The place was not as shiny as it was seen over its webpage but it is fairly a nice place. As far as I have seen the line-up is changing in one or two days. According to the popularity of the musician that will take stage you may need to make reservations. The seating is not very well designed - when you sit on the tables, you see your partner instead of the stage so you have to turn your head to listen. I have to say that the entrance to the performance was not so good but they became better tuned to each other after a while. Our last night in New York has ended in another best jazz club of the city and we were very lucky that it was Paquito D'Riviera's week in Blue Note Jazz Club - a legendary name from earlier times of jazz who has played with many jazz legends such as Dizzy Gillespie. He was with his Panamerican Ensemble at the stage: Alex Brown, piano, Oscar Stagnaro, electric bass, Victor Provost, steel pan, Pernell Saturnino, percussion, Eric Doob, drums. The performance was a energy-full one with a wonderful rhythm line. Paquito has a magic touch to the authentic texture of the music, increasing the tension. More than that, his humorous style made the night an entertaining one also. Our luck did not stop to play with us and suddenly - through the end of the performance - Paquito has called a woman sitting at the forefront to the stage to play the last pieces with him and the band. I, then, noticed that she was Anat Cohen - the rising star of clarinet. I could have the chance to listen to her with a big band in last North Sea Jazz Festival at an open-air performance hall as well as in this year's International Jazz Day in Hagia Irene, İstanbul. Anat Cohen was with a percussionist in Blue Note at that night and two of them had two good performances with the band on the stage. Again, the bar is very far from the stage which is not suitable for a good listening. Furthermore, the club is far from being a square; it is, instead, a rectangular whose one side is very large compared to the other. The stage is located in the middle of the wide side causing that even most of the seats were out of the main view area. You had better make reservations fom the middle part. Jazz Record Center is the best record store for jazz in New York. It is located at 8th floor of a building on West 26th Street. Fred Cohen has been running this place for 30 years. He was there as always when I have visited the place. The place was very tidy and focused on Jazz. I was really impressed by the huge archive. I found many historical records there and had spent almost two hours checking the shelves. The LP archive mostly consists of second hand original records but there are also some new ones. There are also very good CD, DVD, posters and books collections distributed over many different parts of the house. I have been to place for a classical concert held in Mostly Mozart Festival. I got the chance to listen to famous violinist Isabelle Faust. Lincoln Center is a very important place for the whole New York. Located near to Central Park this campus is almost like a cultural breathing center. There are performance halls, an Opera House (Metropolitan Opera House), restaurants, a music school (Juilliard Scholl famous for many famous jazz musician graduates), theaters and many more cultural centers around. The place is founded as a part of a renewal project for the place in '50s. There was also a blues concert in an open air hall when we were there. Avery Fisher Hall is the concert hall which is generally used for classical concerts. This nice place seems to have passed through many acoustical correction. As a result of these corrections the acoustic is very successful today - I liked it too. The night and day views from many other resting places in the center is wonderful to spend some quality time. Boston is a real university center. It is more like a European City considering the shape of streets and buildings. Therefore the city is very calm and naive compared to New York. There is Berklee College of Music which affects the musical characteristic of the place very much. There are two important jazz clubs in Boston: Scullers and Ragatta. Ragatta was closed for a private event during two days when I was there. Thus I could only see Scullers. 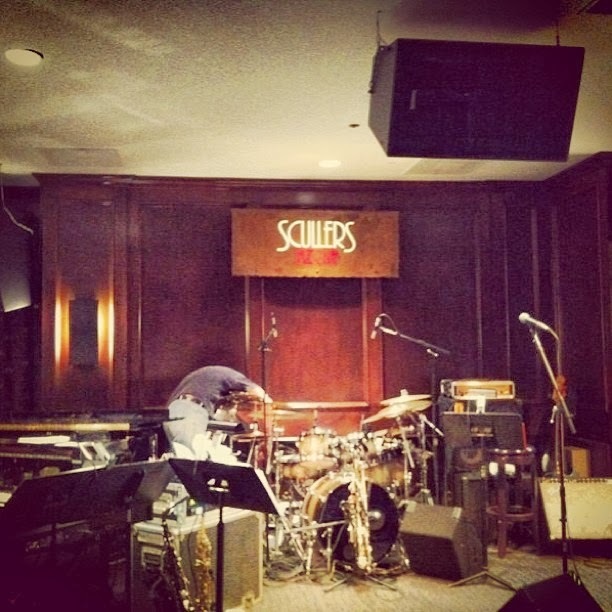 Scullers is located at the second floor of Double Tree Suites by Hilton Hotel at Boston. It is a difficult place to go without a car or a taxi. Besides, the place is very very popular and you should certainly make a reservation in advance. 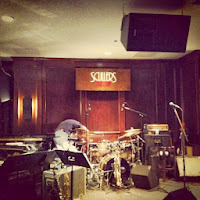 The biggest crowd I have ever seen in a jazz club in USA was in Scullers. Although it was fairly a large hall the place was so full on that night that not a single person can enter after the performance begins. The performance was a Jazz Funk Soul one with Jeff Lorber on piano, Everette Harp on saxophone and Chuck Loeb on guitar. It was really an energetic concert that resembles to a pop-star's one considering the ovation. There were more than one encore. It was a nice music store at the famous Faneuil Hall Marketplace. More than jazz and blues it is focused on rock and pop. You can find CDs, DVDs and BluRays as well as LPs. There are also many memoir pieces with musician themes. Jazz LPs are sold there at very low prices. I should mention name of this place for musicians who are looking for sheet music from legendary jazz concerts or readers interested in music books. There are also many memoir pieces about music in this place. It is located near to Berklee College of Music building. You should also visit the building to see the classrooms and library. Chicago may seem to be focused on blues and there are many wonderful blues clubs there. 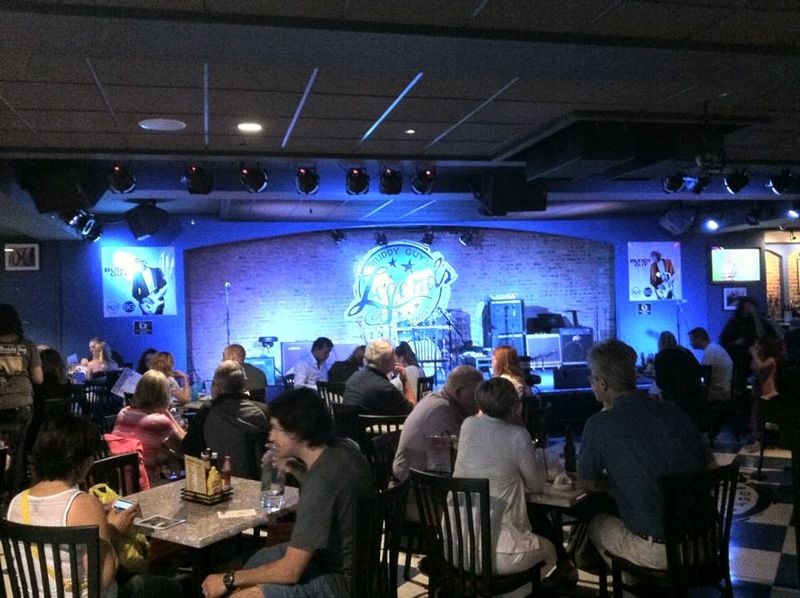 (Buddy Guy's Legends and Blue Chicago are among bests and I have been to these clubs.) However, not surprisingly, some of the best jazz clubs of USA are also in this city. Jazz Showcase, Green Mill and Andy's Jazz Club are at top three. The streets are cleaner and the city is calmer compared to New York. The river crossing the city coming from the Michigan Lake has a real profound contribution to shiny look of the city. Jazz Showcase is located near to the Grant Park. It is a little bit in the inner parts of the city with respect to Michigan Avenue. The club had Claudio Roditti and friends in its line-up for two days. It is surely the biggest club I have ever seen in USA. The stage is is very shiny, having a wonderful label at the right part. The large walls of the place are full of many wonderful memoirs of jazz legends - historical concert advertisements, unforgettable instants from some performances of jazz musicians. The acoustic is almost perfect. There were Jim Trumpeter, George Fludas and Dennis Caroll next to Roditi. Their performance was full of Latin air swinging with American music. I could find the chance to talk to them after the performance. In fact Claudio would perform with McCoy Tyner as Latin All Stars in last North Sea Jazz but the concert was cancelled due to McCoy's illness. Claudio mentioned that he wanted to play in a jazz festival in İstanbul. I also learned from him -and really surprised- that his father is actually from İzmir, Turkey. Jim Trumpeter was wonderful on piano and he gave me two of his albums as a gift. Andy's Jazz Club is a warm and family-like place. It is very near to the famous Magnificent Mile of the city on Hubbard Street. Chicago Jazz Orchestra was on the stage when we were there. The stage location with respect to the bar and half of the tables is not acoustically suitable for a good listening session. In order to have a proper table you should make reservation. Patricia Barber, with her unique vocal and incredible piano playing was always a musician whom I really would like to listen lively for a long time. The coincidental fate caught me on a Monday night at a considerable far place from central Chicago, The Green Mill Jazz Club. Patrick Mulcahy - bass, Makaya McCraven - drums, John Kregor - guitar has collaborated with Patricia Barber for a long time and they were there on that night. Especially, unexpected guitar ingredient to the standard piano format has impressed me very much. John Kregor has a really wonderful acoustic sound and he has given very important solo performances. Drummer Makaya McCraven has also caught my attention. The acoustic of the club is well but the bar side is a bit noisy. There is no reservation policy. In order to have a good view with your partner(s) you should be early because there are just 4 or 5 tables that have a good hear. Besides, I have to say that staff of this nice bar/performance place has a bit cold manner towards people visiting their places. You should certainly use subway, bus or a taxi to go to this club. I used subway to go before sunset. Many of my friends insisted that I should use a taxi instead of subway to go back to hotel after sunset because of some safety issues. I have to tell you that I have used the bus and nothing bad has happened. Near to city center Chicago, on East Illinois, there is the biggest record store for jazz and blues of this world: Jazz Record Mart. On seeing the place, I felt like I am in a shopping mall full of LPs. Here you can find everything you are looking for Jazz and Blues in America. There are many classification titles such as Pre World War II. The prices are generally not high and many wonderful LPs are at low prices. There are second hand originals as well as many new prints. There is also a very distinguishable CD archive. Especially the huge parts for legendary names such as Miles Davis, John Coltrane and Ella Fitzgerald should be seen. The music books are very cheap. Interestingly (or not), the place is not complete for European Jazz. Grant Park Music Festival is an annual event and there are many concerts that are held each year mostly on impressive open-air stage Pritzker Pavilion seeing the beautiful Millennium Park of Chicago, which is also the house for Cloud Gate - The Bean of Indian Contemporary Artist Anish Kapoor. There is also Art Institute of Chicago here, which, I think, is one of the most important modern art museums in this world. On our first day in Chicago we got the chance to listen to Stravinsky's Rite of Spring in this festival from the festival orchestra. Even the place was open-air and the audience were Americans coming from home with picnics, blankets and outdoor chairs there was a complete silence during the performance. It was one of my most beautiful musical experiences in my life. I was almost hearing just some subway and air conditioner noises at the background - I felt like the whole city has been listening to the concert. After the first part, on hearing the ovation, I remembered that I am with more than a thousand people there in the park. It was a fantastic performance. Having seen so many clubs, places and people about music in USA I could get a general opinion about the style of the music as well as the differences between America and Europe considering musical thought in general and in jazz. Surely, America is a big continent and there are still many cities I had to see to have certain ideas but for now I, at least, have some estimations. First of all I can not make a generalization about noise level in jazz clubs. There were noisy places as well as quiet places. However, considering jazz listeners in States, as far as I have seen in these three cities, I think there were many listeners who see a musical performance only as a part or an accessory of an event - i.e a good music with a good dinner or a touristic visit. There is also this type of audience in Europe and Turkey but I think America is a bit more out of concentration while listening. As you can see in details above, there are generally two sets for each night. This is also the case in Europe however you generally pay once in each set and the sets are generally are not individual concerts, instead they are following each other. I can not generalize this but American style of jazz club, consistent with its mostly-money-dependent daily life, is more like an economic, consumer activity. There is almost no possibility of an encore after each set. More than that, for a band playing for the whole week it is hard to perform with joy since the set-list looks like the same everyday carrying even same improvisational parts. a great jazz ride about USA...enjoy.